If you've ever watched any of the Classic Albums episodes on VH1 and then seen that same episode on DVD, you know that DVD is the only way to go. The episode's longer, and in most cases, there's extensive bonus features that get even more nerdy than the clips they use for the main piece. Such is the case with this one. After watching it on VH1, I bought it, and have probably watched it three times since then. I'm a huge Nirvana fan, but this is also just a great little movie (or whatever you want to call it) for anyone who likes to see how an album gets put together. If you can look past producer Butch Vig's Bono-esque eyewear, he's got great stories to tell about the recording of this record, as well as some hands-on mixing board stuff that is incredible to hear. By omitting certain tracks in the recordings, he's able to give a clearer picture as to how the songs were put together, and just how much work he and the band put into the whole project. People who champion Butch Vig as a big reason that Nevermind was so successful won't have any reason to back down from that opinion after seeing this. His methods aren't exactly by-the-book, but damn if he didn't get some great results. However, he's the first to admit that he wouldn't have had as much to work with if the songs hadn't been so great in the first in the place. He talks about how the band tightened up certain parts per his advice, but mostly it sounds like they had the songs down when they showed up. 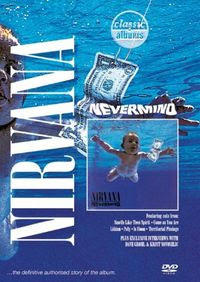 Interviews with Grohl and Novoselic are of course included, along with the ubiquitous Thurston Moore and a few others. But it's really Vig that makes this thing so interesting. Dude's either got an airtight memory or took extensive notes (probably both), because he talks about the recording sessions - and moves through the tracks - like they're still fresh in his mind. It's really cool to watch and listen to. The bonus features, like I said, dive a little deeper into things that are touched on in the main presentation. There's spots on Dave Grohl's joining of the band, some info on the album cover art, and a great segment where Vig meticulously breaks down all the elements that went into one of the record's most expansive tracks, "Drain You." Thank god they did this right. Watch the first segment of it here.